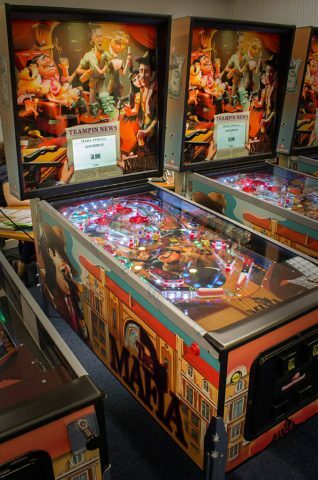 Mafia-Themed Raspberry Pi Controlled Pinball Machine #piday #raspberrypi @Raspberry_Pi « Adafruit Industries – Makers, hackers, artists, designers and engineers! The platform is composed of a Raspberry Pi 3 and a single electronic board (R-board) with through-hole components. The Raspberry Pi 3 runs the game software and interfaces with the machine through the R-board. All the switches are direct switches, they are connected to the R-board and scanned a thousand times every second. The CPU will send responses to the solenoids in less than 3 milliseconds giving sharp feedback and a no-lag experience for the player. The game comes with full RGB LEDs which are also controlled by the CPU. A 12V PSU and a 48V transformer are used for the electronics and the solenoids respectively.